During a high-level round table hosted at the United Nations (UN) headquarters in New York, attendees discussed Oceanix City, a futuristic concept for a sustainable floating city. Developed by Danish architect Bjarke Ingels and a group collaboration known as OCEANIX, this hi-tech vision is intended to serve as a blueprint for innovative solutions to rising sea levels and other environmental threats. Two out of every five people in the world live within 100 km of the coast and one in ten lives in coastal areas less than 10 metres above sea level. The vast majority of coastal areas will be affected by flooding and erosion, destroying homes and infrastructure and displacing millions of people. The UN round table – which brought together innovators, explorers, marine engineers and scientists – explored possible solutions to this looming catastrophe. 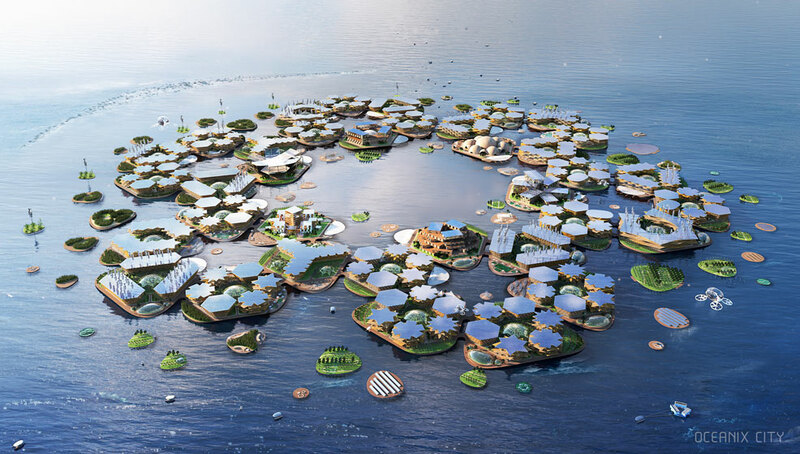 The various cutting-edge ideas included self-sustaining, floating cities able to produce their own energy, food and fresh water, while generating zero waste. Oceanix City was presented in support of the UN's New Urban Agenda, which aims to set a new global standard for sustainable urban development. According to its designers, this would be a "resilient and sustainable floating community" for up to 10,000 residents on 75 hectares. Its modular configuration would allow the habitat to grow, transform and adapt organically over time – evolving from a small neighbourhood settlement, to a village and eventually a maritime metropolis, with the possibility of further scaling. The world's oceans are under an increasing threat from land reclamation. As coastal cities struggle to cope with population growth, many simply pour sand into the ocean to create new land – such as the megaproject announced for Hong Kong. Unfettered coastal urbanisation is destroying millions of hectares of the ocean and marine life. Climate change and rising sea levels are compounding the problem. 90% of the world's largest cities will be exposed to rising waters by 2050. Projects like Oceanix City could be of major help in reducing humanity's impact. "It is not a question of one versus the other. The technology exists for us to live on water, without killing marine ecosystems," said Marc Collins Chen, CEO and co-founder of OCEANIX. 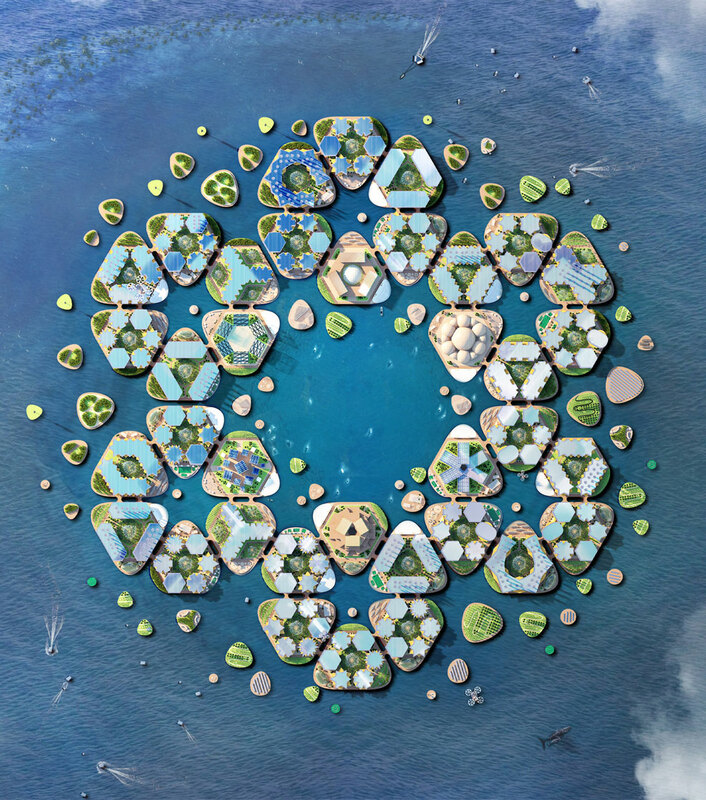 "It is our goal to make sure sustainable floating cities are affordable and available to all coastal areas in need. They should not become a privilege of the rich." Oceanix City would use electric vehicles to transport people to and from the nearest coastline. Shaded terraces would provide comfortable indoor-outdoor spaces, with rooftops fanning outward to cool internal spaces and the public realm below. Platform architecture could be site-specific and responsive to social, political, environmental and economic considerations for each location. Communal farming at the heart of each neighbourhood would allow residents to embrace a culture of sharing and zero waste, growing all of their own food. Below sea level, underneath each platform, a range of systems would be in place to clean the water and accelerate ecosystem regeneration. Socialising, play and commerce would be concentrated around the sheltered inner harbour, with markets, event spaces and nightlife creating a lively community. Oceanix City is not only sustainable, but also flood-proof and designed to survive even the most powerful storm systems. In the event of a long-term major shift in weather patterns, the entire floating city can be unmoored and towed to a more suitable location. "The sea is our fate – it may also be our future," said Bjarke Ingels, founder and creative partner of Bjarke Ingels Group (BIG), widely known for buildings that defy convention while incorporating sustainable development principles and bold sociological concepts. 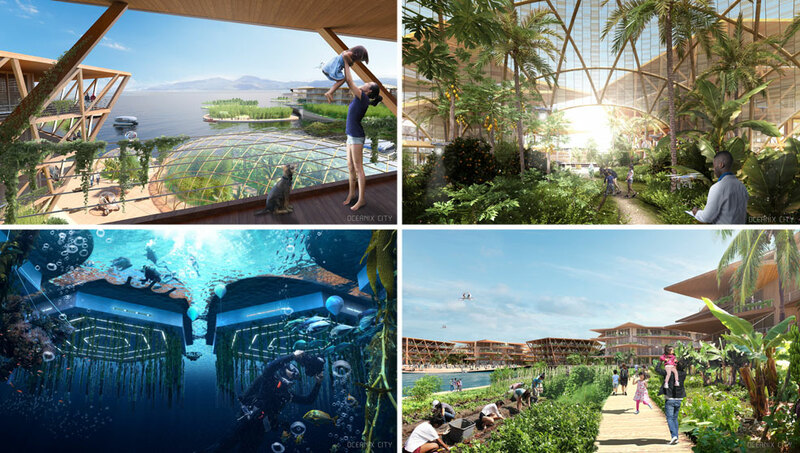 "The first sustainable and self-sustained floating community Oceanix City is designed as a human-made ecosystem channelling circular flows of energy, water, food and waste. Oceanix City is a blueprint for a modular maritime metropolis, anchored in the Sustainable Development Goals. The additive architecture can grow, transform and adapt organically over time, evolving from a neighbourhood of 300 residents to a city of 10,000 – with the possibility of scaling indefinitely to provide thriving nautical communities for people who care about each other and our planet." Oceanix City is not just a vision. The UN plans to work with OCEANIX, the Massachusetts Institute of Technology, and The Explorers Club to build a small-scale prototype on the East River later this year. "Everybody on the team actually wants to get this built," said Collins. "We're not just theorising." Additional renderings can be seen in our video below, which includes an animated fly-through. You can subscribe to us on YouTube for more science, technology and future-related content.